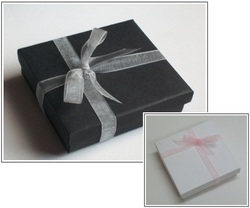 Each piece of jewellery is sent in an handcrafted gift box as standard. Each box is custom made for the piece upon your order being recieved and will be made to your specific choice of box and ribbon colour. Please send your selection either with the note option on Paypal or via the contact option here. If you do not supply a personal choice, the box will be sent in either black/white with a random ribbon colour. UK (1st class): 1/2 working days. Rest of world** (Airmail): 7 working days. *All times are estimated by Royal Mail. In unforeseen circumstances (ie. adverse weather conditions) delivery times may be longer. **International customers (Non UK) are liable for any import taxes/duties imposed by their countries on items dispatched to them. _Returns are accepted for 30 days after dispatch date if item has broken during normal usage. The customer can choose between a repair and return or refund. Refunds will be purchase price only. Return postage will not be refunded. After 30 days a repair and return service is available, postage to return the item to me must be paid by buyer. Refunds will not be given for items that are found to have been mishandled / damaged by the customer. Due to health and safety, earrings are non-returnable.